Join me today in an expedition through the world of (corporate) cultural anthropology. Sure, the title is all about job satisfaction but the end game is much like what we’re all trying to do – create the right and best corporate culture. To do this, most will go straight to listing and celebrating what they know or believe to be the essential characteristics. That’s not where I prefer to start. I’m an onion layer peeler…if not a beacon of classic diction. If you follow my blog you’ll have noted my marketer’s natural thirst for insight and root cause. This same appetite is certainly needed here because we all have triggers of our happiness. We can’t just say we’re a fun place to work and we all become instantly joyous and fulfilled. 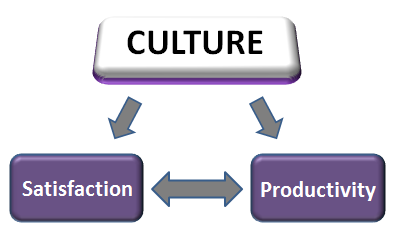 Our cultures are created through behaviors and action steps that must resonate with the intended audience. And that connection happens because of our deep and fundamental understanding of the human need and the evolving role the work place plays in our life. And what’s the point of having a defined culture in the first place? Sure, that question is a bit rhetorical, but I’ll spell it out to maintain the chain of reason. We want to create a culture that optimizes both employee happiness and company performance. As it turns out, we know from published studies (as well as hypothesis) that happy employees are more productive. Happiness is today a more passionate pursuit that reflects the values of a new generation, and a society that provides fewer guarantees of prosperity and security. Against this backdrop, companies are studying it more for the sake of loyalty, productivity and even competitive advantage. So while we’ll definitely keep an eye on productivity, let’s focus on the engine that drives the people that drive the company – happiness. Or, using the more sanitized term, job satisfaction. Out on the net, you will find a number of documented studies and opinions on this topic and just as many proposed versions of the ultimate working environment. What I’m not consistently seeing, though, is the differentiation between the end cultural states and the building blocks required to create them. To explain what I mean, think about how many times you have interviewed or networked with a company that claims to have an entrepreneurial style. Often, am I right? Many times I have asked in interviews what the word meant to them and how they operate. The typical answer would contain references to initiative and creative thinking to start. A thought bubble at that point typically rises over my shoulder as I wonder what companies DON’T value such things. But, I have learned to keep my mouth shut, blink, nod and smile. If I’m in a risk-taking mood I’ll ask the interviewer for the biggest decision they got to make without approval from even one level above. That never ends well since you’re effectively calling the guy a hypocrite if he can’t answer you. But, alas, I have uncovered a gap in thought. Entrepreneurship, innovation and the like are to me by-products of an effective company culture – they are not cultural elements unto themselves for they are made from several ingredients. And because they are less specific, they can end up being empty promises that float on the surface of corporate statements and job descriptions yet do not authentically reflect how a company works, what it believes and how people relate. That’s what I’m here to identify – those critical elements that tap into the emotions of our employees, and make them happier…and better. Freedom is about eliminating boundaries and minimizing the number of rules. One way is to allow employees to work the most when they work the best. As much as we’d like to think everyone likes to get up at 5 am to work out, meditate and cook a healthy breakfast before getting into work for a full day that starts at 7:30 such is not the case. We all have different productivity zones that can operate anywhere within the 24-hour clock. A free workplace can adapt to the employees who are more productive when in their respective zone. Freedom is also as much about connecting as it is about disconnecting. Pico Iyer’s The Art of Stillness is a great book / TED talk. He preaches freedom to disconnect for a few moments, days or even years for the sake of thinking, internalizing and re-energizing. In fact, the theory goes that if you are free to disengage at your will – and you do in fact take advantage of the freedom – you become more focused and centered while on the job. Serenity is never in the unreachable distance, but is instead there for you to access whenever needed. Freedom means our work becomes time, location and media agnostic; we work seamlessly across locations and devices. Companies are beginning to understand this, but in my estimation have only dipped their toes into the water in this area. We are largely caught in the same habits of 20 years ago, only using a technology as an excuse to demand faster response. The first cousin of freedom is Empowerment, which adds authority into the mix. An empowered workforce can make decisions and fail up to a certain threshold. Google has recently changed its operating structure under the umbrella company of Alphabet. The idea behind the change was to keep each operating company lean, compact and of course empowered. This article was published as an indicator of how the company has changed; key people right up to CEO level miss meetings and all are expected to push on. If you miss a beat, it’s your responsibility to catch up – no hand-holding allowed. Years ago (OK, probably decades by now) I worked for a company president who was a relatively young, blunt European dude. He would take three weeks of vacation every summer to go back home. I’ll never forget the words he spoke every year: “I truly don’t care if this place burns down. Do NOT make any attempt to contact me. You’re all smart people; you can figure it out”. Not exactly the 2015 way of articulating a thought but there was a positive message behind it. No one is indispensable; all are capable. The notion of empowerment has other tentacles. An empowered person is in control to not only make decisions but influence the projects they work on and their career trajectory according to their level of interest. Employees can opt out of certain events while volunteering to contribute to a team outside of their domain. We’re seeing the beginnings of this in tech companies where, say, finance teams are learning to code at their leisure. Less force, more inspiration. Better commitment. As much as the first two pillars may seem all about making the job easier, the truth is that most employees are turned on by Advancement (and the celebration thereof!) — for both the company and for themselves. If you haven’t heard of Shawn Achor, take a look at this video to help yourself get acquainted. He’s a long time Harvard academic who has transitioned into the corporate domain to apply his work on the science of happiness. One of his insights is that we crazy people in the business world love to place the markers of success or achievement beyond the horizon. Meaning, if we sell a million dollars, we immediately raise the goal to 1.5. If we pay off our mortgage, we go buy a bigger house. We struggle to find the balance between embracing the satisfaction that comes with achieving and pursuing unmet goals. Consequently, we have this persistent feeling of being up against it. This is taxing on our emotions and level of happiness. A strong culture will know how to address this. A word appearing more frequently in the culture vernacular especially among millennials is ‘purpose’. This article from Forbes expresses it well, explaining that young professionals in particular no longer subscribe to the fee for services mentality. They are inspired by a broader mandate of societal impact that goes way beyond the results reflected on an income statement. That corporations are simply vehicles to generate shareholder wealth holds little value or attraction among a cohort that is seen to be deriving less and less benefit from this type of success. Larger achievements require appropriate recognition. While more money doesn’t necessarily make you happier, you need to still be paid a fair wage for your credentials. Benefits need to at least be in line with market. Business results need to be rewarded with a smidge more than a pat on the back. So yes, this is my cursory head nod to the material. No, it’s not the driver of satisfaction, but it similarly shouldn’t be causing dissatisfaction either. A powerful element that’s commonly overlooked under the domain of org advancement is efficiency, a direct path to productivity. I have often told my teams that they should always look for things to stop doing and they find it an inspiring challenge. I do, too. If you don’t think people get a charge out of such things, note the euphoric ripple through the office when someone cancels a big meeting. It’s real. On this topic specifically I have already written. High ROI on time is what I’m about, so it comes up often. You can read up on the areas that are prime targets for efficiency along with a few of my ideas on how to have a new respect for people’s time in this recent article on select high-impact culture strategies. There’s something to be said for a work environment that values blasting through the administrative sludge for the sake of being able to focus efforts on high-impact tasks and projects. Similarly, lean org concepts are being embraced more organically, and not because of some consultants hired to find efficiencies. I could spend multiple articles on this alone but for now I’ll leave you with one angle: work groups and decision making. We love to gather. We love the concept of ‘team’. We think consensus is heartwarming. The fact is, studies have shown you only need 2-3 people to solve a problem. Every additional person erodes the productivity per capita while not serving to improve the outcome much. It also introduces counterproductive social dynamics (e.g. politics). Lean teams and lean decision making infrastructures are a must in today’s zooming market to have any hope of adeptly reacting to competitive vectors. Perhaps my favorite pillar is one that is also partially addressed in the culture strategies article mentioned above – Inclusion. Luckily, most of us are social animals who subconsciously tend to band together loosely in groups. The danger point comes, however, when we identify and marginalize the outliers. In my post I make the pronounced point that if we call out people for being authentically different, we are actively suppressing creativity and innovation. For creativity requires one to not only be unique but assertive, and we teach each other daily that this is bad bad bad. This insight highlights the purpose of this article. To say you have a creative culture is one thing…even if you have creativity brainstorming meetings which are superficial from a productivity standpoint. To actually have a creative culture demands a respect for individuality and more importantly, a way to integrate this diversity seamlessly into all you do. That’s inclusion: the process of embracing diversity. Still, I’m mindful that if we’re some collage of individuals we must be unified by something or else we don’t really have a culture now, do we? What brings us together is the meaningful vision of the company and the belief in these pillars. The impact of how we dress, what political party we support, the energy with which we communicate or how we express our spirituality should be neutralized. And stop building teams of exclusively Type A hyperbots who ‘work hard and play hard’. Pfffft. I work hard and then I recharge, thankyouverymuch. That could be meditation, dinner with friends or 90 grueling minutes in the gym. Dunno. By the way, some of the more transformational minds reside in people who hardly speak. Don’t be afraid to harvest that talent in a company where abnormal becomes the new norm, I say. For a start, check out this article on pairing introverts with extraverts to create a dream team. Sensational stuff that gives my people hope. I have both read about and experienced transparency as an essential tool to build trust and security. This video on select HR practices at google makes a huge deal about transparency. Execs regularly share board level presentations about the most intimate strategies and plans for the company. Not only does this custom get everyone on the same page but it makes them feel a deeper ownership for performance, as a result of being included to this level. The trust becomes even stronger when the information is disclosed with not even a veiled threat about sharing. Transparency is even more important when a company’s results are headed in reverse. For those of us who have worked under such conditions, we have seen firsthand how the openness dissipates. The impact on feelings of trust, security and job satisfaction is significant and palpable – almost like a deafening silence that hangs over the office like a storm cloud poised to strike. Very few other stellar cultural phenomena can overcome the effects of this singular dynamic. Management must showcase its courage by engaging teams when times are especially tougher. Consistency strengthens a team dynamic; a lack of it can erode belief in a culture in the same way that it will tarnish a brand. Nevertheless, in all situations, employees should not only be informed but also have a voice. The best companies have both formal and informal two-way mechanisms to get feedback on itself, processes, managers and culture. Collaboration is a sensational form of inclusion and is essential to evolve the life form that is an organization. The last component is what I call Tone and it’s almost a catch-all, although nonetheless crucial. It’s in many ways the vibe that reverberates inside the walls. The most direct definition reflects how management and execs approach a problem or opportunity. I worked for a company that believed that unless you frame an issue as a crisis, people will not focus on it. True, crises can generate focus but they at the same time sap the energy that is required to sustain productivity (and positivity!) over the longer term. Tone also considers the manner in which employees relate to the company and to each other. Looking at previous pillars, for example, if you increase freedom you must in tandem preach accountability; they work hand in hand. My article from last year on work-life balance makes a clear point that although you have permission to leave the office whenever you like, you do not have permission to abandon your teams. Thinking the same way, you will suppress independent thinking in an environment that does not champion respect for others. In my recent post on the beautiful mind of an entrepreneur, I remind everyone that strategies and decisions cause reaction…and the best leaders build anticipation into their thought process. Culture design is complicated and so not technical; even the most well-meaning strategies can have undesirable and very human consequences that must be predicted and mitigated. Some companies have tones are relaxed and informal. Others are buttoned up and very corporate like. The last company I worked for was quite small – only about 50 people – but it was competing against very large companies for customers. The CEO felt that we had to have an exceedingly ‘professional’ (as he called it) veneer so that we could ‘compete above our fighting weight’. I got it…but it wasn’t really my thing, since I typically sit in any chair with one leg draped over the arm. If I can think back to a time when I only gave 100% to a project or role – instead of my usual 120-plus – there was a breach of ethics or trust involved. I have lived through both minor and major circumstances in this area and can tell you from experience that ethics and values are catalysts for inspiration. I doubt I need to work hard to convince you. One significant component of the organization and broach most of these pillars and make a singular, huge difference in your short-term happiness: your manager. You can find many studies and surveys out there that point to the immediate manager that can be either a positive influence in a terrible culture or be the sole cause for a person to leave a company, even in an otherwise well-run company. I don’t want to overlook this piece but at the same time, look at the components that are most integral and long-lasting in an organization. Notice that I didn’t bring up compensation, perks and benefits. It’s true – money can’t buy happiness, however the absence of money can be a demotivating factor. The lesson there is to pay market rates…and overpay when you need to, to acquire necessary skills and credentials. The rest – catered lunches and Euro chic offices – are just table stakes to be in the running to lure talent. Once they are on board, these perks only contribute nominally to happiness or loyalty, unless they are designed creatively to integrate into a satisfaction pillar. I’d build technology-free break times into the work day. 15 to 60 minutes to develop a hobby, create or clear your mind. Work out, meditate, solve a problem on paper, organize your thoughts, connect with teammates. This is just a starter list. My hope is that we can all apply strategic thought using the pillars as a base to more rapidly transform our cultures into 21st century beings; they are definitely not there yet. No, this post isn’t just for managers. It’s for you the employees. All too often our frame of reference is what we actually experience or hear about from friends and peers. There’s more we can do as we’re only scratching the surface, and the impetus needs to come from not only above but below. We still have Gen Xers and Boomers at the help and they think the young’uns lack focus and need to learn to be professional. They don’t all yet understand that there new ways to work and inspire and reflect how society is transforming. They need to be taught and the time is right for the new cohorts who make up half the work force to assert their influence and do the teaching. The first step requires honesty and insight about your own motivation. What I have left you with today is a tool box of insight — your foundation for a great culture. Building a culture is like building houses; the materials are the same. The end product could match your neighbor or be totally different. Take the necessary time to get to the heart of your own happiness. Use that learning to influence robust and innovative strategies around each of these pillars…and you’ll build a house that everyone will want to live in. The Most Satisfying Jobs. Think of the Progress pillar. In these jobs you are usually not setting and re-setting unreachable goals. As a hair stylist for example, you can come home every day having delivered for every client you served. Few loose ends and no incomplete work. Fresh challenges that next day that you have no reason to anticipate. The Difference Between Diversity and Inclusion and Why It is Important to your Success; from November 2016. Music to my ears. August 2017: Great article from a different perspective from Harvard Business Review. It looks at employee satisfaction from the perspective of the feelings or needs that they have to have: value, renewal, focus, purpose. Great perspective that sets the objectives of the five pillars. I’m getting great feedback…and thanks! I’m also starting to get questions about how to go about building culture and how to use these tools to move forward. Would love to help or even answer that in a blog post, but it’s not that simple. I have just presented the marketing equivalent of the 4 Ps, and I’m now being asked how to use them to build a business. Well, my friends, that’s the stuff that books and collegiate degrees are made of. Having said that, I will look for ways to parcel such a massive topic off for subsequent posts. Stay tuned!